$150 OFF When you purchase 2 Wedding Bands - *minimum value $395 per ring Use coupon code "150off"
With an extensive collection of styles to choose from, Gabriel & Co.’s classic and fashion-forward designs ultimately bring together impeccable artistry with enduring technology, perfect for every unforgettable moment. Pairing a Gabriel and Co. engagement ring with a mesmerizingly matching Gabriel and Co. wedding ring exudes an aura of coupled perfection. Gabriel and Co. wedding bands are designed with an artistic excellence other jewelers strive to fulfill. The Gabriel and Co. selection at Icing On The Ring is as broad, flawless, and innumerable as a lustrous endless romance. The dynamic range of Gabriel jewelry is a series of elegant vintage beauty in their constructed art deco wedding bands to modern, avant-garde one-of-a-kind uniqueness in their utterly striking designs. 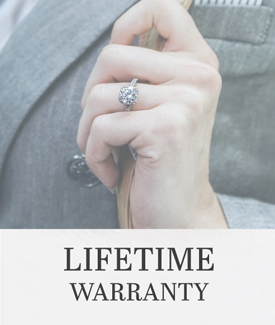 Gabriel and Co. utilizes a meticulous system of thoroughly vetting their selected diamonds to ensure only the finest and premium quality diamonds are fitted onto your immaculate diamond wedding band. Established by two brothers, Jack and Dominick, the family business of procuring Gabriel and Co. wedding rings was a trade taught by apprenticing their expert gemologist father. Their thorough artistry coupled with expert manufacturing exemplifies Gabriel jewelry to be one of the best retailed at jewelry stores in Downtown L.A. The renowned jewelry engineers at Gabriel and Co. put an emphasis on their craftsmanship upon delivering the most superb quality diamonds to the LA Jewelry District. The top-grade choice metals and especially obtained gemstones by the expert gemologists are passed through a series of guidelines and standards that is of maximum eminence. Visit our Los Angeles showroom at Icing On The Ring to see these divine women’s wedding bands dazzle in front of your very own eyes. Thoroughly recommended by Gabriel and Co., shopping for wedding bands is encouraged to be done in person at our qualified store. Each diamond is unique in its own manner and setting to fit your individualistic personality and style. No two diamonds are the same, no two wedding bands are identical; ensure your perfect match at our Icing On The Ring showroom today. A beautiful Art Deco band features pavé-set diamonds in 14k white gold marquise shapes with detailed engravings to create flair for a wedding band or casual stackable. A creative option for the more whimsical individual, this pavé-set band features alternating shapes that make it perfect for a wedding band or stackable.